The midnightblack N200Mid-Tower Computer Case from Cooler Master is compatible with micro-ATX and mini-ATX form factor motherboards. It features an edgy asymmetrical design with mesh on the front panel. It supports up to three 3.5" HDDs and four 2.5" SSDs. It also features a SuperSpeed USB 3.0, USB 2.0 interface, and audio-in and -out slots. 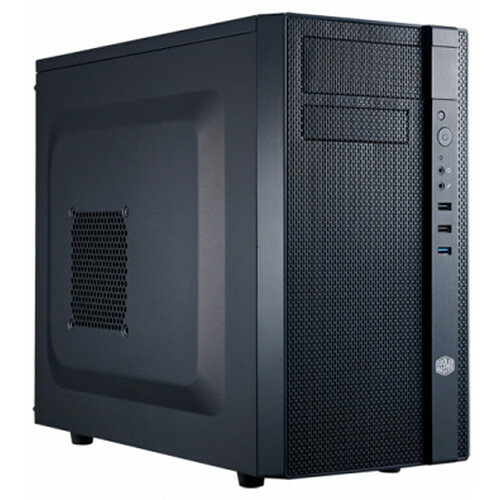 The case is supplied with two 4.7" Xtraflo fans, pre-installed one in front and one on the rear panel. Additional fans (optional) can be installed; one more in the front, one on the top vent which has a dust filter, and one on the side. The front fan can be replaced with a 9.4" liquid cooling radiator (optional) while the rear fan can be replaced with a 4.7" liquid cooling radiator (optional). High-end graphics cards supported with a length of up to 14"
It supports CPU cooler height of up to 6.3"
Internal Drive Bays 3 x 3.5"
Box Dimensions (LxWxH) 19.9 x 16.7 x 10.0"